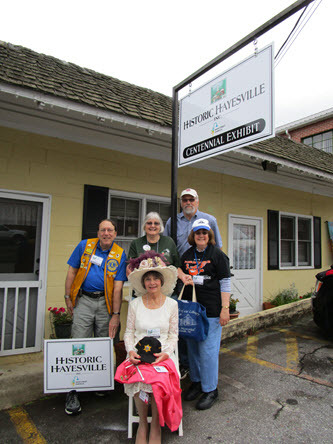 Volunteers at the HHI Centennial Exhibit which also serves as the Small Town Main Street headquarters represent partner organizations working together with common goals for downtown Hayesville. Support from Clay County clubs and organizations include Chamber of Commerce, Travel & Tourism, Lions, Rotary, Historical & Arts Council, CCCRA, American Legion Post 532 and others linked to this website. Small Town/HHI Design Committee and Friends of Historic Hayesville provide plants and maintain appearance on the Square in partnership with Town of Hayesville, Clay County Communities Revitalization Association and Clay County Sheriff's Office Inmate Work Force. 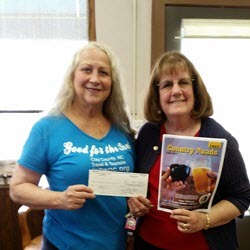 Generous support from Master Gardeners, Clay County Lions Club, Clay County Farm Bureau, Lewis Nursery, Woodhaven Construction, Lowe's and public donations combined with many volunteer hours provides a welcome venue. HHI Board members gave part of a grant they received from Master Gardeners to CCCRA at their February 2018 Board meeting to help with replacing older trees inside the historic courthouse square. 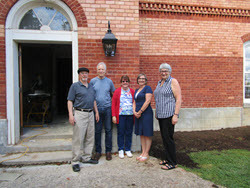 CCCRA and Master Gardeners are two of the partners working with HHI along with volunteers representing several other organizations and the Town of Hayesville for beautification of the historic courthouse grounds. 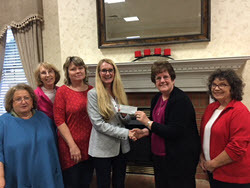 STMS/HHI Board members presented a check for more than $6100 in November 2018 from Steins & Wine Around the Square event ticket sales to the Clay County Historical & Arts Council Board to be used for repairs to the Old Jail Museum. HHI board members present a check from the ticket sales of the 2017 Steins & Wine Around the Square event, to Clay County Communities Revitalization Association board members at the November 2017 Town Council meeting, designated to benefit the CCCRA's courthouse restoration fund. 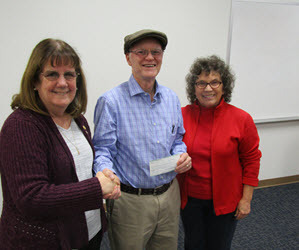 HHI donated just under $10,000 from fundraisers during the past 12 months to the CCCRA courthouse restoration fund. Clay County Communities Revitalization Association board members gather at the historic courthouse with Mayor Harry Baughn and members of Historic Hayesville, Inc. to celebrate a donation from 2016 Steins & Wine Around the Square ticket sales. 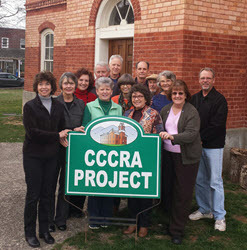 CCCRA will continue to pursue corporate and grant funding and host fundraising activities to benefit the courthouse preservation project. 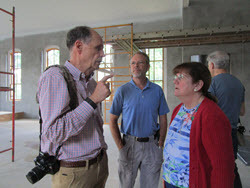 Representatives from NC Department of Commerce made a site visit to Hayesville for the Small Town Main Street program in May 2018. 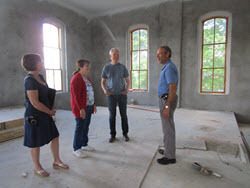 They met with Board members from Historic Hayesville Inc. and Clay County Communities Revitalization Association (CCCRA) restoration project managers to see their progress inside the Historic Courthouse. 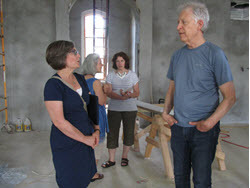 When they returned on July 20th 2018 the restoration was complete with an official opening ceremony on July 21st. 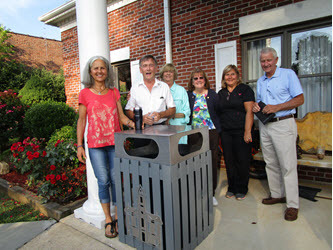 Small Town Main Street Design Committee Chair Deborah Nichols is shown with volunteers, Town Council member Sarah Buckley and CCCRA Board member Paul Price as they view a trash/recycle bin prototype by Melvin Swanson as a proposal for use on historic courthouse grounds by next year. 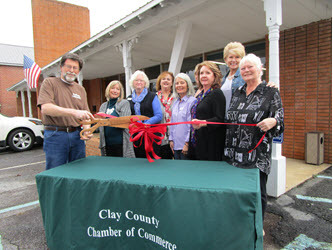 Small Town Main Street/Historic Hayesville Inc. welcomes the Clay County Chamber of Commerce to their new location on Sanderson Street and appreciates their ongoing partnership for downtown projects. 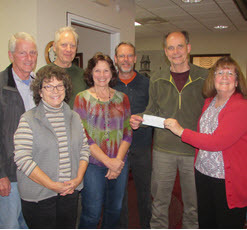 Friends of Historic Hayesville is a committee under the Small Town Main Street program supporting the Economic Vitality committee efforts with gift baskets featuring certificates to shop downtown businesses. 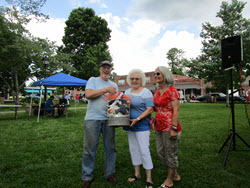 Drawings are held during events such as the annual Car-B-Que sponsored by Rotary Club of Clay County and the Festival on the Square sponsored by the Clay County Historical and Arts Council. The Rotary Club of Clay County partners with Small Town Main Street/Historic Hayesville Inc. for downtown projects and events. 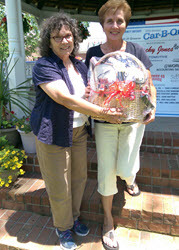 For the 2018 event an antique oil can filled with gift certificates and items for classic car care was presented by Mayor Harry Baughn and HHI Board member Sharon Heaney to the lucky winner at the 18th annual Car-B-Que event. 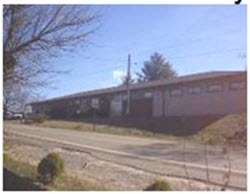 Moss Memorial Library has served Clay County for decades as an educational, cultural and public internet center. 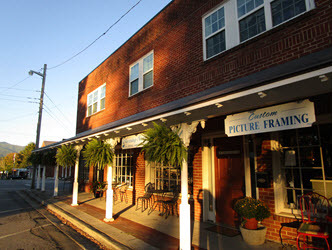 Located just across the street from the Historic Hayesville Inc. Centennial Exhibit, the Library is a valuable partner to HHI and the Small Town Main Street program with a genealogy room available to supplement family history research and online services to make additional connections to public resources. 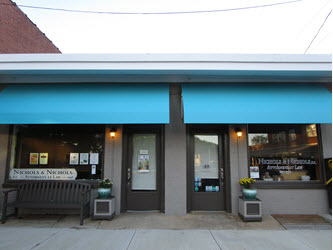 The knowledgeable staff offers a great selection of books and magazines with a connecting door to the Friends of the Library Bookstore. 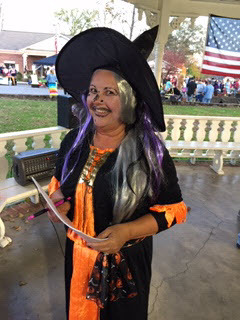 STMS/HHI Promotions volunteer Surbrina Baumgartner as the "good witch" organized a judging committee for Best Costumes in partnership with Town of Hayesville for "Halloween Around the Square". 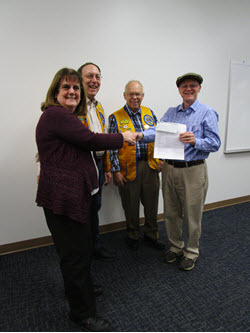 Clay County Lions Club continues to show support and partner with Small Town Main Street/HHI for downtown projects. They saw the need for a bike rack on the square for those who choose a great ride through favorite county routes and return to downtown. 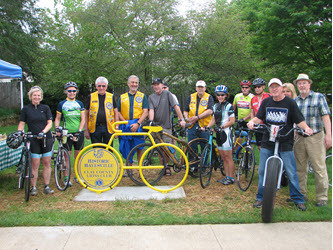 The Lions donated and unveiled the new rack in April of 2017. A limited number of historic courthouse scale models were handcrafted by the Lions Club in partnership with Small Town/HHI as a fundraiser to support the CCCRA courthouse restoration project. The Lions Club and HHI courthouse model fund-raiser was very successful and a check was presented by representatives from both organizations to Clay County Communities Revitalization Association at their February 2018 Board meeting. The Lions Club and project designer Frank Fascella has donated the original prototype to CCCRA for display in the restored historic courthouse. Lee Holland, Chair of Clay County Travel & Tourism, presented a check to HHI Board Secretary, Deborah Nichols, to support the publicity campaign for the annual Steins & Wine Around the Square event which benefits downtown projects including CCCRA Historic Courthouse Restoration fund. Small Town Main Street/Historic Hayesville Inc. is honored to have Clay Lodge 301 A.F. & A.M. as a supporting partner and neighbor for the Centennial Exhibit on Sanderson Street. 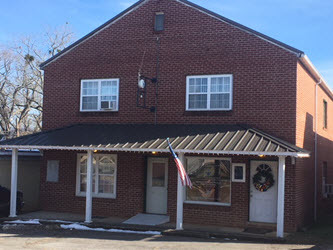 The Lodge was established in 1868 and is still active as the oldest organization and home for the earliest historical documents about Clay County. 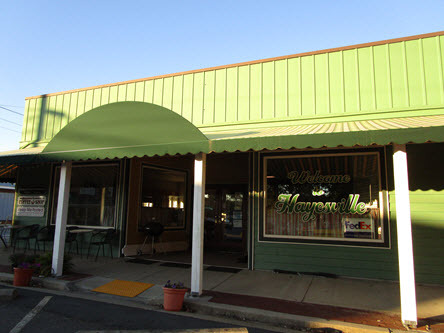 Facades featuring new awnings were one of the first projects on the Small Town Main Street plan launched in 2015 in partnership with Town of Hayesville, property owners and businesses. 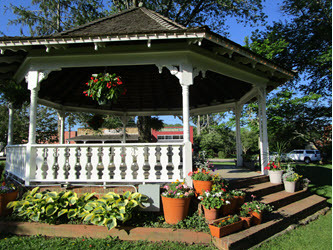 Designs are still available from UNCG as a benefit from the Small Town Main Street program. Interested business owners should contact HHI for details. 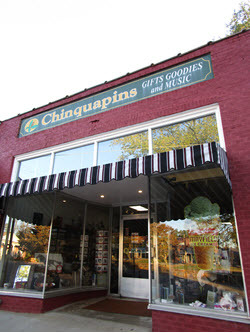 New awnings for Chinquapins and the shops at the corner of Church and Main Street in downtown Hayesville. © 2019 Historic Hayesville Inc.